Gilsland, close to Greenhead and Hadrian’s Wall, is a village that straddles the border between Cumbria and Northumberland and provides an amenity centre for visitors touring Hadrian’s Wall and other features of historical interest in the area. Gilsland is quite an isolated village with large tracts of forestry and high ground to the north and south which has many popular public footpaths, bridleways and cycle trails. The AD122 bus service operates frequently, every two hours, from Easter to October but less frequent in the winter months. The opening of the railway station in the 1830’s brought many tourists to Gilsland which sadly closed many years ago. The River Irthing which rises in the hills around Paddaburn Moor in Border Forest Park flows south and after passing Butterburn Flow it rushes over the 10 metre high Crammel Linn waterfall at Irthing Gorge and then flows to the west of Gilsland then heads on west to join the River Eden near Newby East north of Warwick Bridge. Irthing Gorge, a sandstone gorge, and Crammel Linn waterfall is a site of Special Scientific Interest and the woodland around the gorge is classed as ancient and semi-natural. 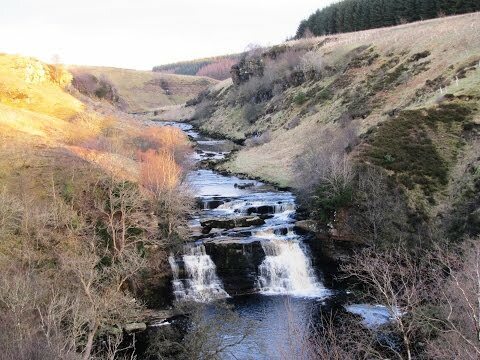 The waterfall and gorge is a beautiful and peaceful area seldom busy with visitors but is easily reached on a well marked permissive footpath. The ruins of Thirlwall Motte and Bailey Castle are situated on the bank of the River Tipalt and close to Greenhead and Hadrian’s Wall. The castle is of 12th century and was the home of the Thirlwall family who extended it into a fortified hall-house between 1330 and 1350. It was later strengthened using stones from Hadrian’s Wall, but began to fall into disrepair in the 17th century with much of it falling into the river. The castle has been restored over the last 3 years and can be visited safely and free of charge. The site is now a listed Grade I building and Scheduled Ancient Monument status. We park at the side of the road near the village hall in Gilsland and then walk downhill to the bridge over the River Irthing. We turn right in front of the telephone box and take the river path sign posted Irthing House ¾ miles. We follow the path over the fields with the river on our left for about half a mile then enter into some trees through a gate on the left. With the stepping stones over the river on our left we keep heading forwards and go through the gate where there is a seat and head towards the buildings of Irthing House in front of us. At the end of the buildings we go over the stile opposite and walk forward and slightly right to another stile and the road. We turn left onto the road going uphill. As we walk uphill we pass a seat and admire the view of Gilsland Spa Hotel on our left then go over a cattle grid on the brow of the hill. We keep walking on the road downhill then uphill to the next brow where there is a house on the left and a sign post for Longbyre 1 ½ miles on our right. We turn right over the stile and walk forward over the field with newly planted trees go over another stile and head down to the buildings of Barron House we see down below. We walk through the farm and head slightly downhill on the farm drive to the bend. At the bend just before a cattle grid we turn left over the stile and follow the arrow pointing over the field bearing slightly right towards the railway line. We head for the tall post, cross over the stream and turn left along side of the stream. We go through a sort of gap in the fence and turn right after a short way we turn left just in front of the railway line and head forward with the railway line on our right. We then go over the ladder stile over the wall on our right and head forward on the path close to the railway line until we come to the road and the railway crossing where we turn left and follow the road to Thirlwall Castle. After visiting the castle we carry on forward through the gate and follow the River Tipalt on our left to a gate. We go through the gate and head forwards over the stream coming into the river then over the railway line. We pass some buildings on the left and at the road we turn right. (There is a car parking area on the left at the side of the buildings.) We walk on the road uphill for a short way past the golf course on the left then at the raised house on the right we take the footpath over the ladder stile on the left. We head forwards, now following the course of Hadrian’s Wall, past the farm on our left. We keep heading forward through a gate, through a field then another gate just at a stream and then head forwards following the dip between two embankments. At the wall we go through the gate in the corner on the left. We keep heading forwards and at the next farm we follow the path crossing over a little bridge on the right and immediately left. We head forwards keeping to the wall on our left until we come to a road. We cross the road taking the path opposite and following the arrows to another road which we again cross and take the path opposite we walk forwards through a gate and turn right downhill then go under the railway line and follow the path round to the right which takes us back to where we parked our car. We now drive over the bridge at the telephone box where we started our walk and take the right turn at the t-junction we then go over the main bridge over the River Irthing and turn right at the next t-junction. We follow the road into the wood and then the road turns sharply to the right. Just after we come out of the wood we park off the road next to a permissive path sign to Crammel Linn Waterfall. This ten minute walk on the permissive path to the waterfall is well worth it. This is a moderate walk with a few steep inclines and declines. Approx 5 miles using OS map OL43, Hadrian’s Wall. Gilsland is near Greenhead in Northumberland. From Carlisle take the A69. After passing Brampton take the B6318 on the left sign posted Greenland and Gilsland. At Greenhead turn left then immediate right staying on the B6318 to Gilsland. There is plenty of road side parking. To get to the car park go under the railway line and turn left at the junction. There are no public toilets. For refreshments there is The Bridge Inn, The Samson Inn and House of Meg cafe in Gilsland and the Greenhead Hotel at Greenhead. There is a tea room at Thirlwall Castle when open. There are public toilets and plenty of shops at nearby Brampton and Haltwhistle.